Thumbs up from the Northampton-based Hot Tubs At Home team as they look forward to a successful future. 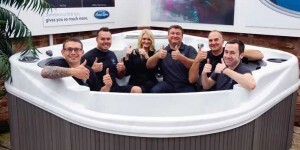 Resilience in business is an essential skill that Northampton-based hot tub dealership Hot Tubs At Home has mastered to a fine art. Specialising in Coast Spas, chemical products and spa accessories and serving Northamptonshire and the surrounding counties, Hot Tubs At Home occupies a large showroom at the Bell Plantation Garden Centre in Towcester. After scraping through the last few years of the credit crunch and having overcome several business hurdles along the way, the Hot Tubs At Home team finally came out on top. The showroom now measures 2,500sq ft – five times its original size with 18 hot tubs on display, plus log and thatch cabins, a 14ft swim spa and an exclusive infinity edge swim spa. The driving force behind the business is Jennifer’s husband Daren who oversees the day to say running of the company as well as managing the sales team and four fully trained technicians. Earlier this year Hot Tubs At Home picked up three prestigious awards at the Coast Spas International Dealer Seminar in Vancouver, Canada. The company received a Platinum Club Award for its outstanding sales performance, along with an Outstanding Customer Service Award and it was the only company to receive the international Outstanding Growth Award.